PERCH - Yellow?, European?, Lake? - What's your pleasure? No, this is not something you buy for the bird cage. HA! Perch! Get it! Oh I kill me sometimes! SPECIAL NOTE: Ocean Perch is not really Perch at all. SURPRISE! After all those years of fish eating, NOW we find out that it wasn't even Perch that we ate. 1. The European (perca fluviatilis) native to Europe and Asia.2. The Balkhash (perca schrenkii) native to China, Kazakhstan, and Uzbekistan. 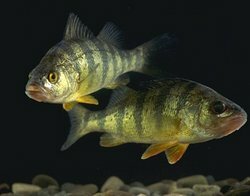 The Yellow Perch is found in freshwater lakes, streams and reservoirs all across North America and Canada. Just about anywhere you expect to find bass, crappie, or pike, you will find Perch in abundance. They are known by their yellowish skin punctuated by vertical dark stripes. They also have rough scales, nostrils (go figure!) and the eyes ain't got no lids on them! A funny creature, to tell the truth. Spawning is in the spring, around March or April, when the water is still relatively cold (45 to 55 degrees). The eggs are deposited in a long, jelly coated string in water up to 10 feet in depth. A single female can lay up to 25,000 eggs. The males come along and do their part and the babies hatch in about a month. 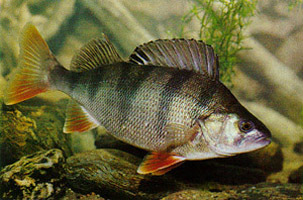 Young Perch are unguarded by the parents and are on their own from the start, so they hide among the gravel or weeds. After that first summer, they will be approximately 3 inches long and ready to begin a real life. Adults can reach a weight of 5 pounds or more. Didn't know that, did you? Neither did I until now. Anyway, the more commonly caught Perch are less than two pounds for the most part. Any fish over two pounds is considered a prize.The world's record Yellow Perch is a whopper of 4 pounds, 3 ounces, and was hooked in New Jersey around 1865. Surprisingly, for the smaller size, these are a predator that has no real preference for anything. Smaller ones (under 4" long) will eat small invertebrates and the eggs of other fishes. Larger ones will prey upon alewives, gobies, and other small baitfish. 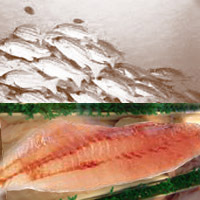 If the available food supply changes, these fish exhibit an ability to adapt accordingly. For this reason, they can be caught on just about any bait you throw out there. Artificial lures, especially spinners, are a favorite. Live bait such as minnows, night crawlers, maggots (bee moth), or soft crawdads also have been seen to work wonders. This is a panfish, folks, and is best eaten when dusted with seasoned flour and seared in a hot skillet until the flesh flakes easily. However, steaming, poaching, and deep frying are fine as wine too. Some small Bass MAY be mistaken for the Mr. Yellow, but the presence of the vertical stripes is a dead give away. Also the skin is a yellowish tint, whereas the bass is a basic dark green. For further information, please contact us or visit our DISCOUNT SOTRE.